Here at Perry Bishop and Chambers we pride ourselves on our integrity, exceptional customer service and hard work. All of these factors enable us to achieve the best possible results for our customers. Whether you are selling or buying property Perry Bishop and Chambers can help you. We also specialise in selling land and new homes. 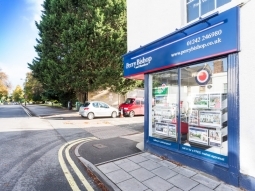 Based in the popular Leckhampton area of Cheltenham, our office has a good knowledge of Cheltenham town and the surrounding areas. The fees were comparable with other agents, the service is what made the difference which justified the fees. Although the 1% agent's fee may be higher than others, we felt the service we received gave us good value. Mid range but I opted for the tasteful signing and brochures produced by Perry Bishop rather than opting for those of cheaper firms. Also I wanted an agent with a branch in Leckhampton. Very good value for what they did for us. We are happy to pay the agreed price, for the considerable amount of work done on our behalf. Reasonable and in line with other local agents. I thought their fees were fair and they worked hard for them.